One of our core values here at Divine Living is that when things aren’t quite going as planned, you have to be open to course correcting—quickly. And to really live and work by that value, it’s not just something you do in reaction to a sudden problem. You have to consistently keep your eye on where you’re at, where you’re going and whether you’re on track to meet your goals. Most business owners will set goals for themselves at the top of each year, but what they might not do is ever look at those goals again until the moment they realize they’ve missed them. Early on in my own business, one of my mentors taught me how important it is to stop, take a moment and reassess your long-term plans in a very purposeful way. 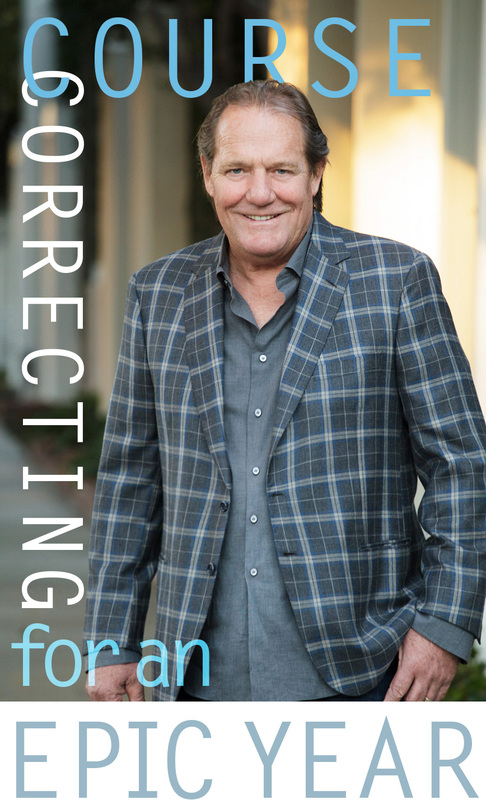 To check in and look at what the strategy was and whether a different one might serve you better moving forward is what course correcting is really all about. We are now halfway through the year and it is exactly the right time for all of us to consider how we’re doing. In our companies, we’ve got to look closely at our sales, our metrics and our team’s performance. We should be checking in on our business plans and asking, are we meeting our targets and completing our projects on deadline? What have been the unexpected challenges? What’s working, what’s not working? On the personal side, we should also think about our relationships, lifestyle, health and spiritual practice. Have we taken the time, self-care and action to achieve our personal goals? Is it working? Revisiting our big-picture vision empowers us to go for it in a new way, to adjust and fine-tune and prepare to finish the year on a high note. Remember that a lot can change in six months. 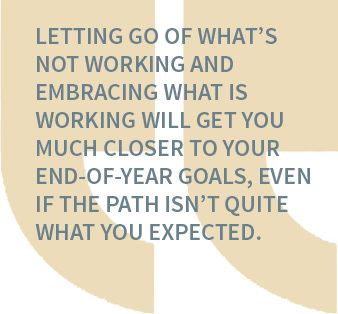 Letting go of what’s not working and embracing what is working will get you much closer to your end-of-year goals, even if the path isn’t quite what you expected. For example, recently Gina and I took a day to reassess our 2016 plans and I’m glad to tell you they now look a little different. We’ve made some key changes in responsibilities for certain team members, and decided to drop one of our programs to focus on expanding a highly successful one. Our new plan is better informed by our experience and we’re now back on track to have an amazing year in our business. We’ve adjusted our goals and while they may not be quite what we originally imagined, they’re pretty close and they set us up for a big 2017. After going through this process together, Gina asked me to share some thoughts on how to be mindful as you consider your own mid-year course correction. We encourage all of you to schedule three hours or even two days in your calendar in the coming weeks to ask yourself these questions. Sit down with your team with flip-charts and markers, schedule an intensive with your coach, take some time to journal, or a mix of all of the above. Before you begin, check out my three tips below to get mentally prepared for the epic year ahead. When you’re trying to process a ton of information and come up with a new plan, having the input of people you respect and admire is key. If you have a close business partner, you may want to work on this together like Gina and I do. You can also check in with your mentor, coach, or mastermind group—people who will help you see things in a different light. Something I did was come prepared with questions for my own mastermind group, looking for their insights on what’s been going on with Divine Living. I’ve always found that when people gather together, great things happen. Bringing in a mix of perspectives can lead to a solution you never even thought of. A lot of the time when plans and projects aren’t coming to fruition it’s because they aren’t matching up energetically. Sometimes things just need to be tuned up a bit, but other times they need to be dropped completely. If something isn’t working, hasn’t worked, is giving you nothing but headaches and doesn’t seem to change no matter what you do—then the universe is telling you to take a look at this. What is this resistance really about? Is it about you, or is there something misaligned in what you’re trying to do? It may be time to move on from whatever particular project has been blocking you and open up to a new direction. You don’t have to be afraid of defeat, or admitting defeat, when every ending is an opportunity to try doing things differently. If you’re attached to something with your ego and it’s just not working, there’s no need to drive yourself crazy when there’s certainly another way to do it that will be just as successful and make you even happier. Being in denial about the need to move on or change course puts up road blocks that stop you from reaching your true potential. You won’t be able to find a new solution until you clear out the resistance. There’s no need to even consider the phrase “giving up”—you can have faith you’re still going where your heart leads.